Hello, friends! It’s been a suuuuper busy week around here. This weekend is my cousin’s 30th birthday, and his wife’s baby “sprinkle” as well. My sister and I are throwing the sprinkle, so I’ve been making decorations all week. My other cousin is also coming into town today to stay with us for all the festivities. Needless to say, I’ll be pretty quiet over the long weekend with so much going on. I’ll also be showing you details to the sprinkle in the next couple weeks! 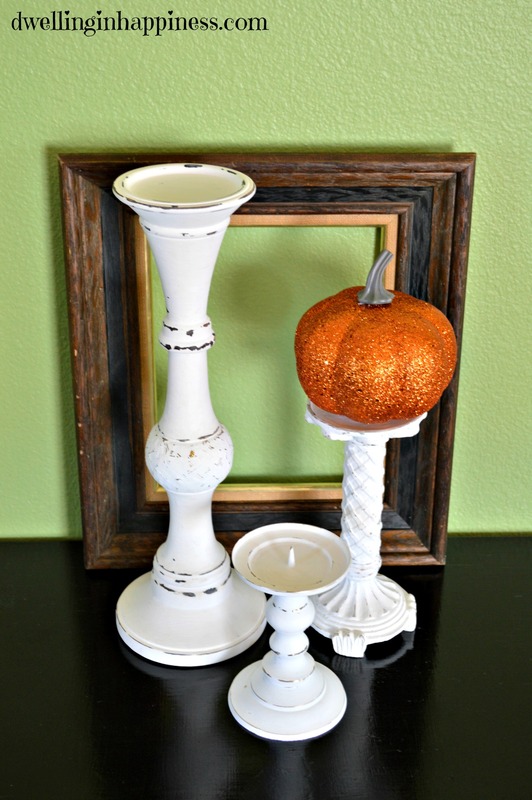 BUT, before all that happens, I wanted to share these DIY chalk painted candle holders! 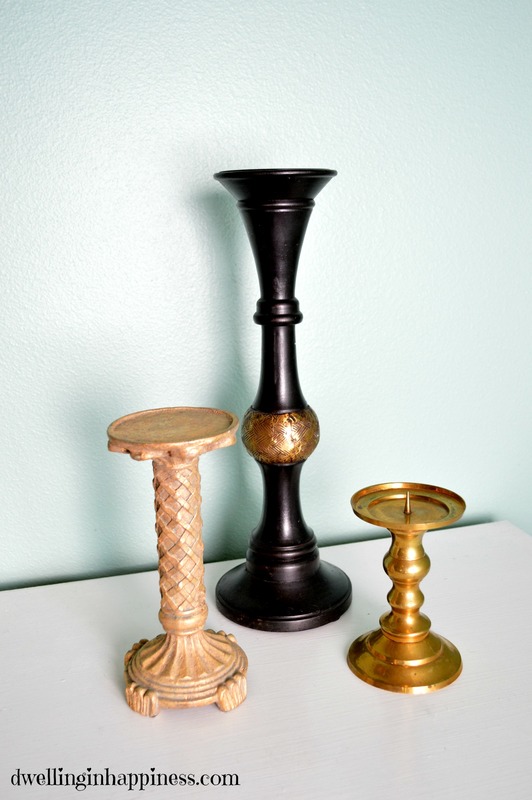 I found these 3 mismatched candlesticks at a thrift store for cheap. I’ve been wanting something else to adorn my entryway table below my gallery wall, and I thought these would be perfect. I also had some leftover Folk Art Chalk paint from another project. 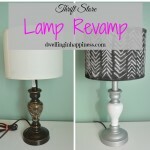 I’m all for saving a buck and re-using! I started by wiping down the candle holders with a wet paper towel to make sure there wasn’t any dust or dirt. I then used a paint brush to paint on the chalk paint. I let it dry about 2 hours between coats. Originally I was going to just do 2 coats, but I ended up doing 3 just because I really wanted to make sure you couldn’t see any paint brush streaks. I let them dry overnight, and in the morning, I used some sandpaper and roughed up around the edges a little. Unfortunately on some spots the paint chipped off, but I actually really liked some of the gold hints that showed through! I probably could have gotten away with only 2 coats like the instructions suggest, because I had to sand a little longer to get the paint to distress. But it turned out just like I wanted it to. No complaints here! They work perfectly on my table, and just in time to hold my glitter pumpkin I found at the Dollar Store. Score! It’s my first fall decoration, too. You better believe I’m trying to hang on to summer as loooooooong as possible. But this pumpkin is pretty, so it can stay. 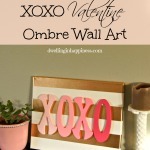 This is an easy and quick project that can be done in a day, though I took a little longer. 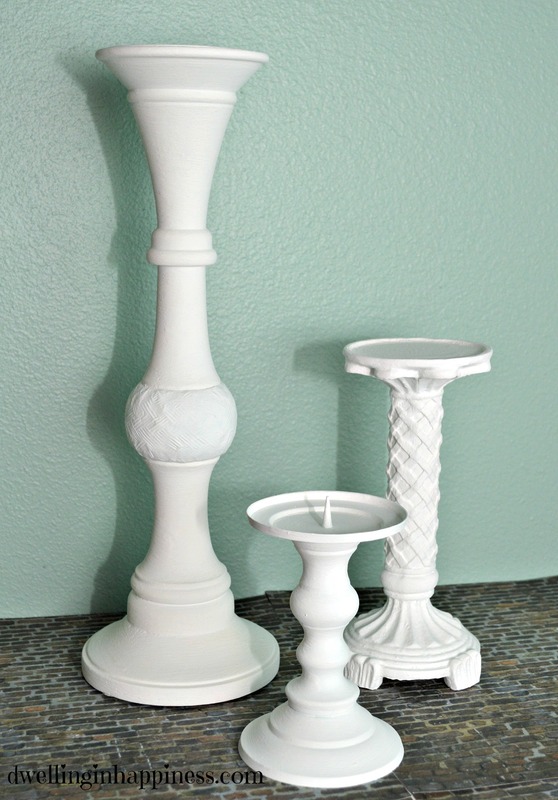 I love how the candle holders are mismatched, too! 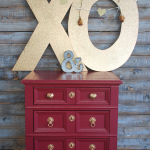 This chalk paint is pretty amazing. 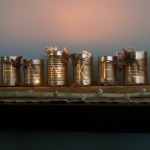 I highly recommend using Folk Art paint! I also used it for distressing my frame in my shower thoughts towel rack. Love it! I hope you all have a crafty, fun, and safe holiday weekend! I know I will. 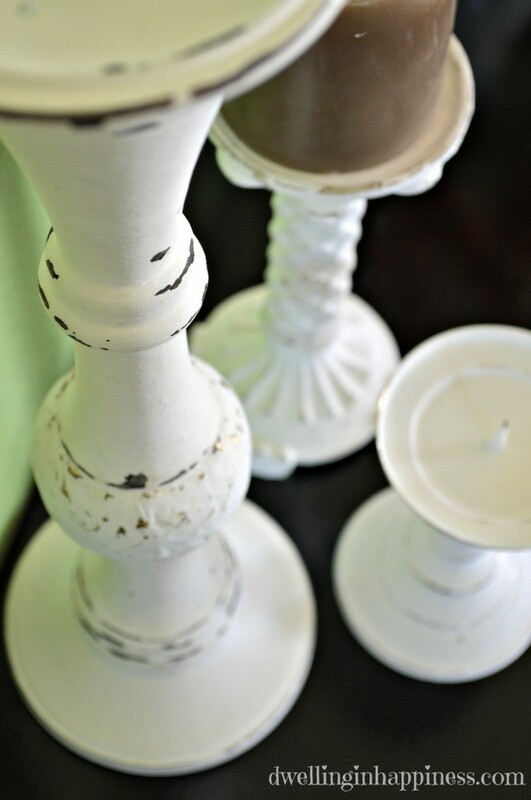 Have you used chalk paint on a project lately? SUCH a beautiful addition to your entry table! LOVE them!!! Love these, Amanda!! The distressing is perfect! Which thrift store doesn’t have hundreds of candleholders? I am off to find some! Enjoy your weekend, friend! That looks awesome! What a great job and they look so professional! Suzy recently posted…Pretty in Pink Springtime wreath…. Thank you, friend!! 🙂 Have a fabulous long weekend! You do such great work Amanda. 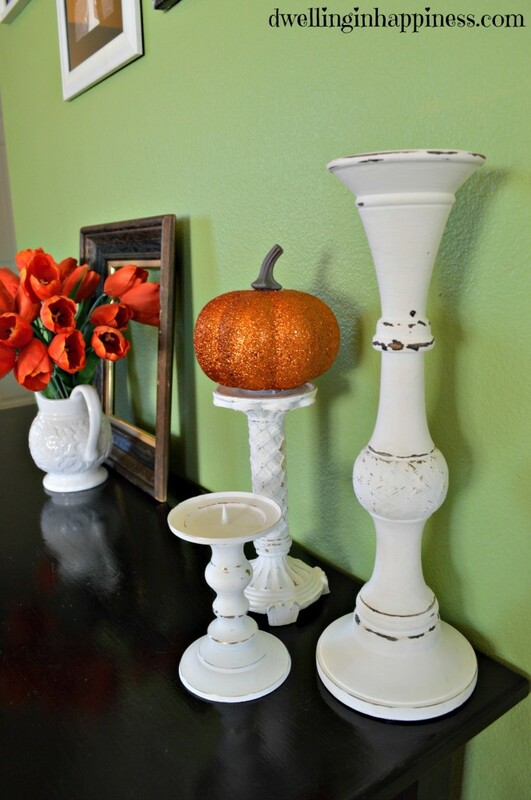 I love the look of the chalk painted candlesticks. They would fit perfectly in my house. 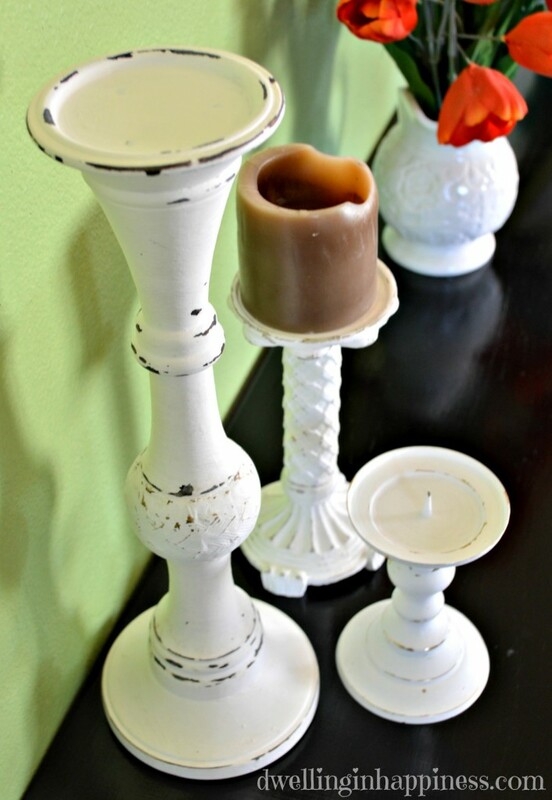 This techniques is perfect for some of my ugly candlesticks I have tucked away in the cupboard. Now, I only need to find some time to play. Thanks for sharing. Pure Grace Farms recently posted…Foodie Fridays Link-Up Party Where Every Link Gets Pinned! 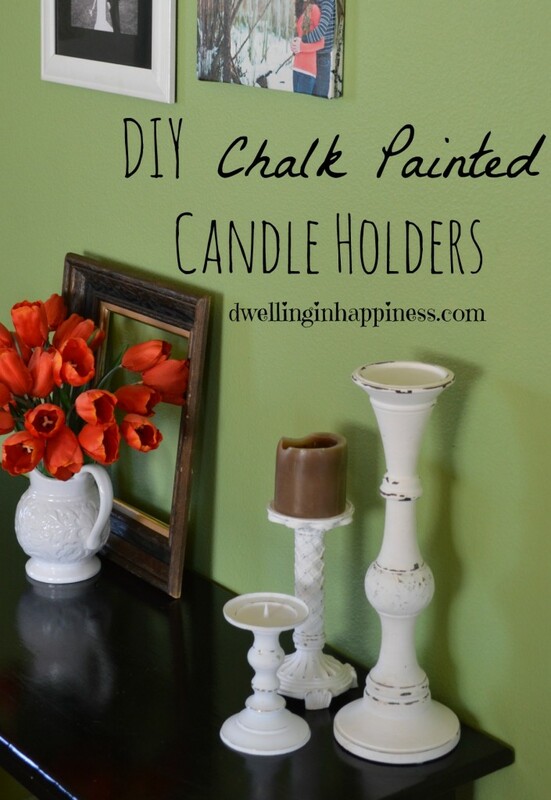 I didn’t even know folk art had chalk paint! Love the look, great job! I really need to get to Goodwill for some accessories to paint! Ha, I didn’t either until I found it by accident at Joann’s! I love it! Thanks so much, Kristina! 🙂 Happy weekend! OMG I wish I were as creative as you! I have NO creative/ arts & crafts bone in my body! ha ha! They turned out great Amanda! What a transformation! Thank you, Jessica!! Totally super easy to do, that’s why I love it so much! And thanks, I’m pretty excited about the feature!! 🙂 Hope you have a fabulous week friend! 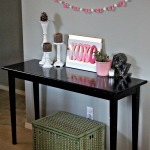 Thanks for linking up at the Pretty Pintastic Party! Your post has been chosen as a feature at this weekend’s party, and will be pinned by all! 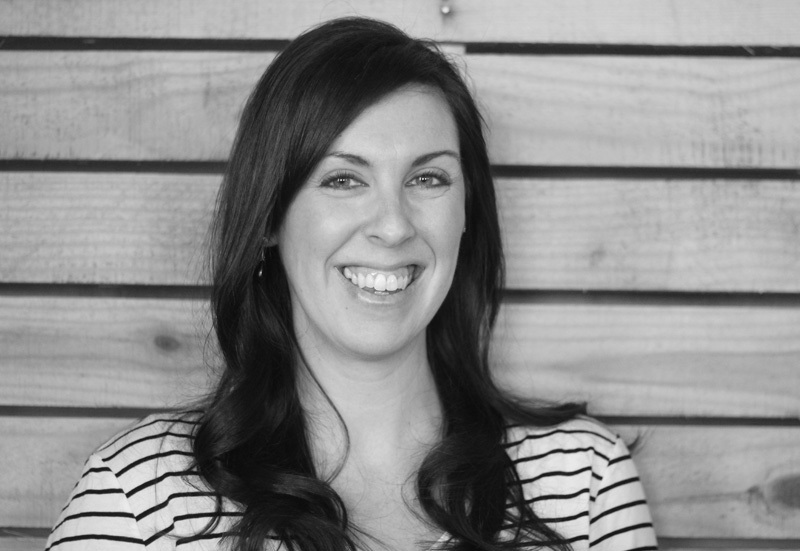 Thank you so much for the feature, Jamie!! 🙂 Have a great week! Wow, you are so creative! I never would have given those old candle sticks a second thought. Painting them all the same color really pulls them together. Love it! Thanks for joining us for Hump Day Happenings this week! Thank you so much, Jenna! So glad I could link up. 🙂 Have a great rest of the week! Love this idea! You did an awesome job! Thanks for sharing. Those turned out beautiful. I am inspired. 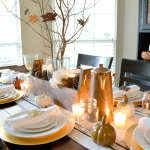 I really like the pumpkin display on top of the candle stick. Stopping by from Pretty Pintastic. Amazing what you can make with chalk! Thank you, Michelle! I just linked up today. 🙂 Have a great rest of the week! Great job! I love the new look you gave to the candlesticks, and that bit of gold showing through is perfect. I’m inspired! What is the reason for using chalk paint? I have not used chalk paint before.